Pioneer Ts-w3003d4 12″ 2,000-watt Champion Series pro Sub-woofer Review. Are you tired of listening to your car’s dull and weak bass sound system? Do you want to replace it with a high-quality subwoofer? Then you are at the right place. In this article, we are going to tell — how you can choose the correct car subwoofer, and we’ll also provide a detailed Pioneer’s 12″ 2,000-Watt Champion Pro Subwoofer review to help you make the right choice. Let’s start with a size of the Pioneer Ts-w3003d4 12″ 2,000-watt Champion Series pro Sub-woofer. Car subwoofers are available in various sizes. The most common diameter size range is from 8 to 15 inches. It’s a common perception that if you have a larger subwoofer, that’ll result in a better frequency. However, you do not require much larger subwoofers since the human capability of listening to the low frequency is 20 Hz. Larger subwoofers also need greater power. 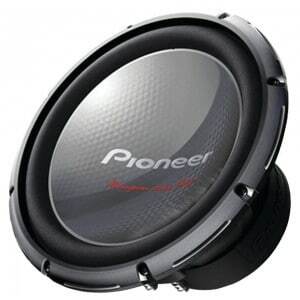 Therefore, a car subwoofer with a 12-inch diameter, like Pioneer’s Champion Pro subwoofer, is best suited for your car. Apart from size, audio quality is also crucial. The subwoofer should not only provide you the right bass but should also enhance the complete quality of the sound that you are listening. If you are listening to music, the total sound of drums, bass’s thunder and the overall range of tunes inside it should clearly come to you. The champion Pro subwoofer provides exactly that. It has the capability of providing 20 Hz frequency for the low-frequency response and 150 Hz frequency for the high-frequency response. Not only that, it has been provided 100% audio quality score by the review site 10tenmag.com. The biggest factor in choosing the subwoofer inside power handling is the sensitivity. So what is sensitivity (dB)? Sensitivity is the measurement of how efficiently a subwoofer can convert the power (in Watts) to sound. Higher sensitivity results in better sound quality even at low-power. The sensitivity of the champion Pro subwoofer is 96 dB. It means that you’ll get better sound even after using very less battery power. Two more important factors inside power handling are continuous power handling (RMS Watt) and peak power handling. The RMS value represents how much constant power a subwoofer can handle for an extended period while the peak power means the highest power which it can handle at one time. In both of these cases, the Pioneer’s subwoofers perform very well with RMS value of 600 Watts and the peak power value of 2000 W.
To get the best results, you should find a very renowned company that provides high-quality customer service. In such case, Pioneer can be an excellent choice. It offers a 1-year warranty on the subwoofer and has complete email and phone support for all your problems and needs. These subwoofers are rated 4.7 out of 5 on Amazon. On Amazon, Anything above 4 is a no-brainer. The number of reviews is also quite high with 114 customer saying mostly positive things about these subwoofers. One user commented that these subwoofers are perfect for the price and he “recommended” them. The Pioneer Ts-w3003d4 12″ 2,000-watt Champion Series pro Subwoofer are priced fairly – See the price Here. After learning all the features of this subwoofer, let’s rewind the pros and cons. High audio quality resulting in great sound. Subwoofers are of correct size. Active customer service from Pioneer. Some users aren’t completely satisfied. These subwoofers by pioneer are great if you want to buy them for a good sound experience in your car. However, some may want even more bombastic experience which may not be capable by these subwoofers. If you like our Pioneer’s 12″ 2,000-Watt Champion Pro Subwoofer review, make sure to comment below. We would love to hear your suggestions.